Raised beds are common on the Gulf Coast for two reasons - poor drainage and clay gumbo soil. Our water table is very shallow in many areas. Soils easily become water-logged after heavy rains. Water-logged soils have insufficient pore-space and plants simply drown (actually, they suffocate). Clay gumbo soil is misunderstood. It actually has a lot of nutrients, but the texture is poor and it's difficult to work. It's heavy, rock hard when it's dry, and sticky as all get-out when it's wet. It can be great soil when improved, but not everyone has the time or inclination to do so. We also have large areas of compacted soils from construction and poor soil management. New residential sub-divisions have been built over land that for decades was cultivated as rice fields or livestock pasture. Top soil is often removed during new construction, leaving a homeowner little to work with. 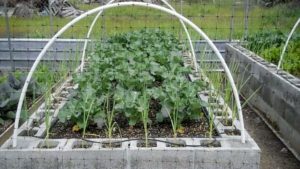 Building a raised bed can solve drainage and texture issues instantly. They are favored for that reason. But not all raised beds are created equally. They must be built correctly. Corners cannot be cut here. You will be disappointed if key mistakes are made, and you may find you have wasted dollars unnecessarily. Building a bed over a weedy patch of turf is a recipe for disaster and disappointment. You can read our page for suggestions on dealing with vegetation here. Before you begin you will need to decide whether your bed will have a border. Rectangular or square borders should be installed before the bed is filled. A curvilinear border can be installed before the bed mix is filled in, or after the bed is filled and shaped. You can read more about borders here. To be truly effective, your bed should not be less than 6" deep. This is the minimum depth I would recommend. Herbs and annuals will work well in a minimum of 6", most vegetables prefer a bed that is at least 8" deep, and perennials and grasses will flourish in a bed that is 8" - 12" deep. There is no real upper limit. I have built several raised beds 2' deep. You can also use berms in your landscape. A berm is a raised bed with sloping, unstructured edges. The peak of the berm may be several feet deep, depending on your overall design goals. Many soil yards around town offer "bed mix". But "bed mix" can be any number of things, and not all of them are good. It pays to do a little research here in order to obtain the best mix for your dollar. Don’t be afraid to ask exactly what is in your mix. If they won’t tell you, you probably don’t want it. A good bed mix will have topsoil and/or loam as a base and will have sufficient amounts of organic matter already mixed into it - as much as a third of the volume. If you are not sure what you want, the safest thing to ask for is “rose soil”. Rose soil is a good blend for most perennial beds and beds that will be a mix of edibles and ornamentals. Bed mix is one of those areas where it pays to shop at the very best, for the very best. My favorite sources are The Arbor Gate and Nature's Way Resources. The Arbor Gate has developed a custom mix called Organic Soil Complete. We have been using it for several years now and it is just wonderful. It has everything your garden needs, no matter what you are growing. It requires no tweaking, which we can't say about many bed mixes. You can purchase this soil in cubic foot bags at the nursery in Tomball and in bulk through their website here - Arbor Gate Organic Soil Complete. Nature's Way Resources has several mixes that can be used in the home landscape. They are soil experts and can guide you to the mix that will support whatever you intend to plant. If you are building a bed for vegetables or herbs, let them know. They have a special mix for this and we like it. It feels a little heavy to us, so we add a bit more compost to it as we plant, and we replenish the compost with each replanting, but it is a good mix to begin with. You can build a raised bed right on top of undisturbed base soil. Simply remove the vegetation, install the border, and fill with bed mix. It is not a necessity to improve the base soil to build a raised bed, but improving the base soil is an option you may wish to consider. Improving the base soil provides a deeper zone of soil with improved texture (tilth) for the roots to penetrate. If you intend to improve the native soil before you add bed mix to raise the bed, you must do this before you add the border, regardless of shape. You will be using a tiller, and the border could create a hazard to the process. A good raised bed can be built by tilling the base soil deeply then adding 4" of compost and 1/2"-1" of expanded shale and blending them thoroughly into the top 6"-8" of soil. You can choose to add mineral supplements and slow release organic fertilizers in the last blending. The bed will be raised slightly from loosening and aerating the base soil, and slightly more from the addition of the organic matter. The bed will not be as raised as it would be with a total fill, but it will be greatly improved soil with better pore spaces and available nutrients. The bed can be raked and shaped, hilling it up a little as you go. Install any border after preparation. The second method involves adding a quality bed mix on top of an improved base. The base soil should be tilled as deeply as possible. Compost and expanded shale can be added with the last passes, if desired. Install the border, if applicable, after tilling. Fill the entire bed with additional bed mix to the desired height. Rake and shape the bed, hilling it up as desired. This method is a great way to decrease the expense of bed mix in a large planting area. Improving the base soil will loosen and raise the bed slightly which will minimize the amount of fill required to achieve the desired bed height. There will be a bit of natural settling after the bed is installed. After you have improved or improved and filled, it is important to allow a resting period before you plant. This resting period allows the soil to settle and for soil biology to re-establish. After you have raked and shaped the beds, apply several inches of premium aged native mulch and water the bed well. Allow it to rest for at least two weeks after which it can be considered as the "native soil" when it comes to planting. We personally practice no-till gardening. We do not till or deeply cultivate the soil. However, we realize that gardening is not a "one-size fits all" activity. There is more than one way to build a raised bed. Decide which is right for you and put your best effort into it.